K2 is an informal settlement located in Site B of Khayelitsha, one of the largest townships in the Western Cape. It was established between 1982 and 1985 and was self-initiated by residents on government owned land between Yomelela and Kukhanyile Primary Schools. Upon partnering with CORC and ISN in 2014, community members of K2 organised an enumeration report where it was found that 423 people lived in K2 in 141 households (CORC, 2014). The number of households, however, has increased to 265 since the report was done. In K2, the entanglement of shacks produces narrow pathways that in many cases allow for only one person to pass through at a time. These limited pathways hinder the access of emergency vehicles and serve as potential areas for violence due to their confined nature. Moreover, there are only 87 functional toilets in the entire community centred in three locations. Because of this, most community members live a three to four minute walk from the toilets and taps which can be dangerous at night and inconvenient for many. Facility problems are just one aspect of K2. Unemployment is also a major challenge, as 30% of the K2 population is currently without work, and for those who are employed, work is often unsecure and poorly paid. Unemployment and poverty are in turn major contributors to gang violence and alcohol/drug abuse in the community. The threat of violence has been one factor that discourages young people from going to school. While community members in informal settlements face a plethora of hardships in day to day life, there are many aspects of the community that remain strong. Community members are very resourceful, and work together to share what they have to help each other. Many community members are active in either leadership roles or pursuit of a job, and work hard to improve their community as well as their families and themselves. K2 community members are working to address and resolve concerns such as children’s education and basic communal facilities. Participatory Action in Informal Settlements­­Living in an informal settlement, community members are exposed to many adversities. These include, but are not limited to, lack of education, unemployment, hunger, poverty, poor health and environment, and substance abuse (UN, 2015). Coupled with these hardships, the feeling of not having an active voice in their society can be crippling. Residents often become trapped in a cycle of poverty that can be difficult to break without extreme effort. Through active participation in community upgrading, community members may be empowered to play a vital role in the development of their communities and improve their individual lives. (UN-Habitat, 2005). Many non-governmental organizations (NGO’s) work to empower community members ­­with the goal that this empowerment may become self-sustaining. NGO’s generally are not designed to run or rule over informal settlements, but rather to support and inspire settlement dwellers. The International Institute for Environment and Development (IIED) promotes Participatory Learning and Action (PLA) stating, “community members need to learn in ways that promote their own sense of empowerment by being proactive and initiating their own activities” (McGee, 2011). In addition, one of the founding editors of PLA, Robert Chambers believes that, “participation is about a reversal of power” (IIED, 2015). Facilitators should plan with community members rather than for community members. We found Botes and Rens (2000) work on participatory community development in South Africa insightful and helpful for our thinking about our own engagement in Cape Town (Botes, & Van Rensburg, 2000). Some methods used for community development include Community-Based Development and Asset Based Community Development (ABCD). Community-based development is an approach that prioritizes the active participation of community members in the upgrading process. The main idea of this participation is to involve members in the decision-making process. This approach may lead to more successful upgrading including community empowerment (Mansuri & Rao, 2004). ABCD is driven by assets found within the community. Projects or community improvements are planned based on these assets. In 2010, a WPI student team worked with Violence Prevention through Urban Upgrading (VPUU) to compile a list of assets that strengthen the community of Monwabisi Park, and documented them with the goal of creating a formal report (Coleman, et al., 2010). To visit their project website click here. The Maitland Garden Village Project (2011) community members worked with WPI to develop a youth and community group called the Green Light Project, as well as repair and improve a crèche in the area. To visit their project website click here. 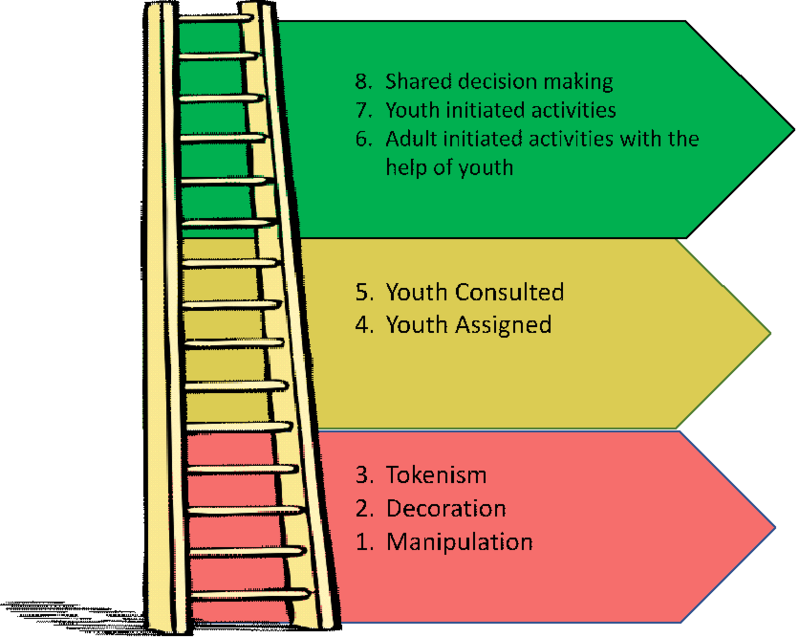 Hart’s Ladder (Figure 1) discussed above in connection with youth empowerment can also be applied to other community members to measure their participation level. The higher an individual is found on the ladder the more involved in the community they are and the less the community relies on outside support. The ladder can also be applied to a larger group of people to help detail their progress and involvement on community projects. One of the original goals of our project was youth empowerment in K2, through upgrading efforts. Upon arriving in Cape Town, the project direction shifted from youth involvement to community involvement as a whole. While our preliminary research focused on working with a younger population, many aspects of this research can be applied to the general community. Below is information about youth participation we gathered prior to arriving. The UN has long recognized that young people are a major human resource for development and key agents for social change, economic growth and technological innovation (UN-Habitat, 2005). Participation is a commonly used approach and concept within community development. Dr. Roger Hart, a UNICEF sociologist, theorized a “ladder of participation” to evaluate youth involvement in community planning and decision-making. The ladder illustrates some challenges youth may face in the participation process. 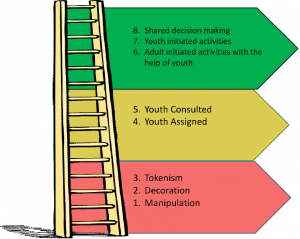 The first three steps of the ladder, manipulation, decoration, and tokenism, illustrate roadblocks to youth participation as adults use young people to move forward in their own projects. Steps four and five show an improvement because youth begin to be informed of how and why they are involved in the project and are also consulted by adults when decisions are made. In step six, youth begin to take initiative in the project. Finally, in steps seven and eight, youth take a leadership role in the project and make joint decisions with adults. Many case studies demonstrate the effectiveness and challenges of youth participation around the world. In Senegal, youth participated in a project that enabled them to become more active citizens in their community. As a result, a youth student council was created to take care of tasks regarding day-to-day management of their school. Afterwards, the youth felt included in the making of decisions as well as gained essential skills such as effective communication. In Ghana, a group of youth were trained on budget advocacy and performed interviews regarding the welfare of children in education, health, water, and social protection. They presented their findings to local decision makers and officials to decide how the District Assembly budget should allocate funds on those issues (McGee, 2011). In South Africa, SDI, Sundance Films, Prayasaam, and CORC hosted a learning exchange and invited youth from informal settlements in South Africa, Uganda, and India. It created the space for the youth to reaffirm their commitment to improve their own lives and their communities. It helped them come up with new improvement strategies and ways of implementing them (Dobson, 2015).